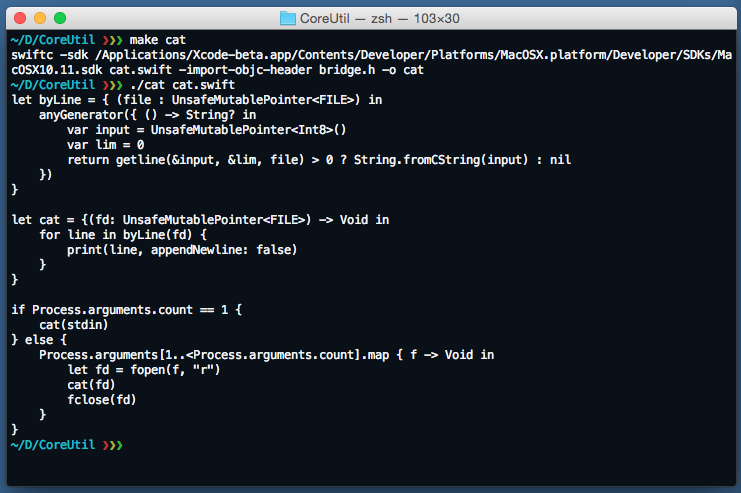 As a homework in one of the early college classes, I was asked to write unix commands such as cat in C. Let’s do that in Swift today! To make things interesting, let’s pretend we are on Linux. That means no Xcode nor Foundation can be used. It’s hard to find a simpler unix program than cat: It takes a list of file names from the shell and write the content of each file to stdout. When no argument is given, it uses stdin as the source of its output. Writing it in C is trivial. Swift has exellent support for leveraging C. But to call even the standard C functions, we need to import them first. Now make cat should take care of the compilation. Hmmmm, how do we deal with all those pesky ‘*’s? It returns the number if characters it finds. The code is also available in this gist.